A large and growing number of students from culturally and linguistically diverse backgrounds in the US and around the world have the potential to develop bilingualism and biliteracy if supported in their immediate environment. 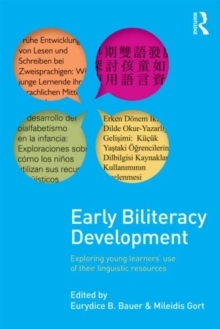 At the forefront in focusing exclusively on biliteracy development in early childhood across a variety of languages, this book provides both findings from empirical research with young bilinguals in home and school contexts and practical applications of these findings. Each chapter is structured in a similar format to offer parallel descriptions of the research, including a brief review of related empirical studies, an overview of the methods for data collection and analysis, a description of the main findings, and specific pedagogical implications to support educators' efforts to construct meaningful, challenging, and dynamic literacy and language learning communities where one or more languages are used for communicating and learning. Pushing the field forward, this book is a valuable resource for helping literacy educators understand and respond to critical issues related to the development of young children's literate competencies in two languages in home and school contexts.